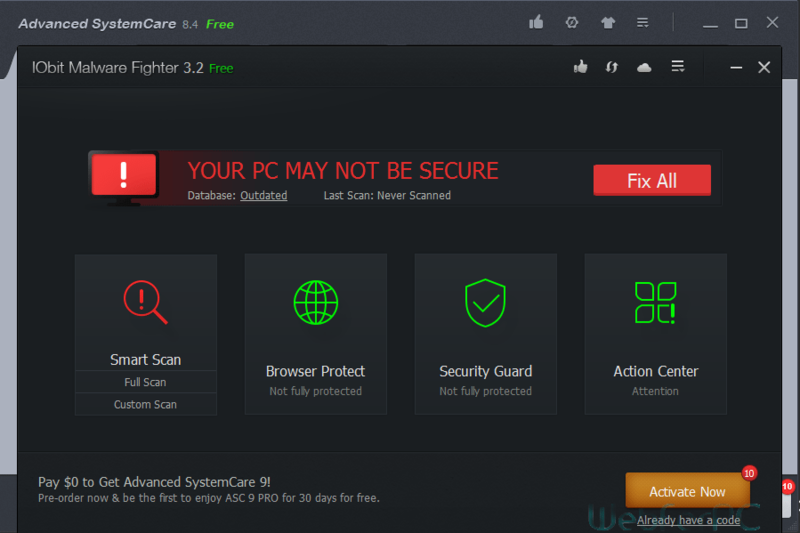 Advanced SystemCare Pro free download latest version setup for PC. Consider downloading Advanced SystemCare for optimizing your computer for best performance. IObit Advanced SystemCare Pro is a utility suite to keep your personal computer safe from all kind of Spyware threats, warms, registry errors, issues effecting computer’s privacy and internet errors. Junk files always consume disk space for their living, resulting slowing down your computer from performing well. Advanced SystemCare Pro 2015 prevents such files to get through operating system and sorts them out if they get their residence in case. Software works as a real-time protector for an operating system to keep it fresh and fast. In our Most recent article we have discussed AVG PC TuneUP 2015, consider visiting. CCleaner Professional as well. Advanced SystemCare Pro comes with many options to optimize and clean up computer from extra files. In addition to conventional PC Performance related tools, Surfing protection panel is also adjusted under UI to control browsing preferences. Surfing protection is there to keep an eye on malicious browser codes while serving as a real-time protection against various online threats. Similarly a plugin-toolbar cleaner would let you sort out adware and malicious plugins which may effect and impact browsing experience negatively. Right after the installation, on opening user control panel, comprehensive summary report is displayed, which would let user know about the fixtures mandatory to do. Pressing “Fix All” button is simply enough to fix all errors and issues just within a minute. In latest version of Advanced SystemCare Pro IObit has added Uninstaller and improved browser protection feature, which serves as a browser anti-tracking utility. Advanced SystemCare Pro serves as a “all in one” utility which is suitable for basic as well as for ultimate system tune up and real-time optimization. Deep windows registry cleaning up options help user to detect errors that are interrupting registry to perform well. Below listed are some of the remarkable features referring this amazing product. Comprehensive protection against malware, spyware, malicious plugins and other online threats. Fixing registry and privacy issues quite quickly. Junk files are sorted out swiftly to get back conquered disk space. Optimized to providing safe browsing experience. Internet Booster to speedup browsing speed. Amazing new skins and catchy look. Product Name: Advanced SystemCare Pro 2015. Updated Here on: 29, September 2015. Compatibility: Windows 7, Windows 8 and Windows 10. There may be many other products for PC tuning, but advanced systemcare pro is intended to work in multiple dimensions. OS cleanup from junk files, fixtures for registry errors and a real-time protection against malware, spyware and online threats is where this amazing product specializes in. Just click the link below to download Advanced SystemCare Pro free latest version setup for PC.